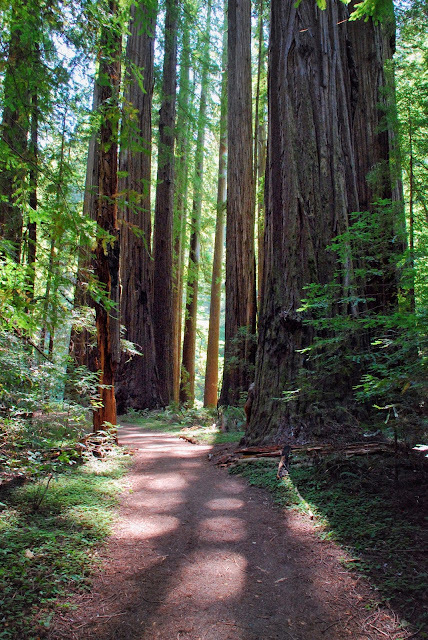 One of the things I’ve been most excited about in moving back to California is the proximity to the Great Outdoors. Of course, there are beautiful trails in the Northeast, but getting out to camp just isn’t quite as easy when you have to rent a car and have no space in your tiny apartment to store camping gear. Here in CA, and particularly in the Bay, it’s pretty much a way of life. (Sometimes it seems like every other person we meet has hiked Half Dome. Me and my fear of heights will stick to trails that don’t involve a tightrope walk, thank you very much.) Since we’ve been back, we’ve been gradually building up our gear again and now we’re back in action. This year we’ve taken camping trips to the Santa Cruz Mountains and up to Humboldt County by the Avenue of the Giants amongst the gorgeous redwoods. (I’ll drop in a few scenery pics at the end.) 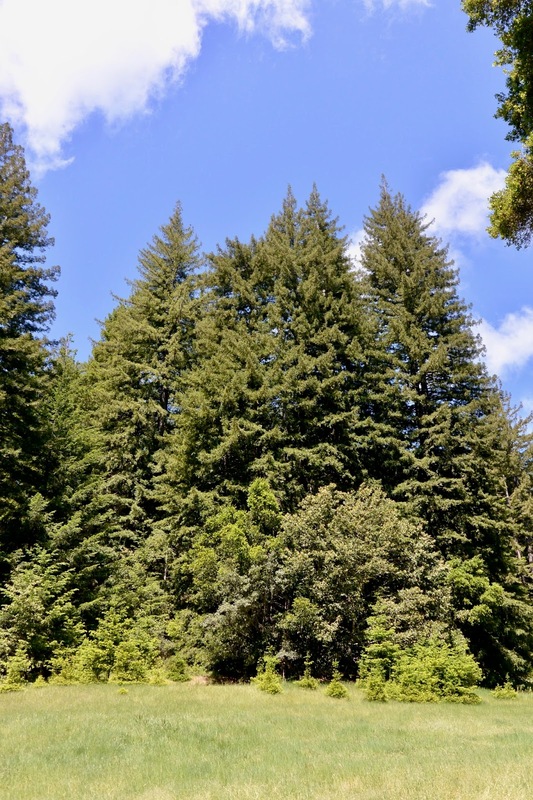 I know summer has come to a close, but I think fall might be even better for camping in CA–summer days can get so hot and sticky. I’m kind of hoping for at least one more camping trip this fall. I really love these camping trips, but to be honest, I still want to eat well. I don’t see why we have to rough it when it comes to dinner. If you’re backpacking, of course, you want to keep things light; but it shouldn’t be hard to have a great dinner while car camping. Moreover, a good meal is a reward for all the long hikes we do during the day. If I do say so, we’ve gotten pretty good at campsite dining. We only have a single burner stove, so we can’t get too fancy–not that you want fancy in the great outdoors anyhow. Nonetheless, we do pretty well with the one burner and a fire pit. It’s also always a great excuse to do some grilling. • Under $20. No need to spend the big bucks for this. • Versatile. 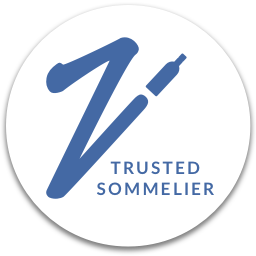 We’re usually cooking on the fly and mixing things up, so it’s good to have wines that will work fairly easily with a variety of foods. • Screw caps are a good thing. We usually have the corkscrew on hand, but it’s pretty nice to be able to just give the bottle a quick twist and done. • Take a chill. Temperatures while camping at night can drop quite a bit, so you might find your reds have been unintentionally chilled well below cellar temp when you’re ready to drink them. It’s not the most flattering to big, tannic reds, even though that might be tempting for campfire sipping. Suddenly those big guys taste kinda tight, harsh, and little sour. (This has happened to us a few times now.) Reds that can take a chill solve the problem, since they’ll be tasty either way. These same factors also tend to make these good wines for most other outdoor activities–picnics, BBQs, etc.–and since they’re all pretty inexpensive, they’re great House Wines too. Here are a few recent highlights. Being out in nature, it only seemed appropriate to have wine that gives back to the planet. I mentioned the Rosé recently, but here’s a recap–Ryan and Megan Glaab of Ryme Cellars started the Uphold line with the idea of giving back. Profits from the white wine go to support environmental causes. 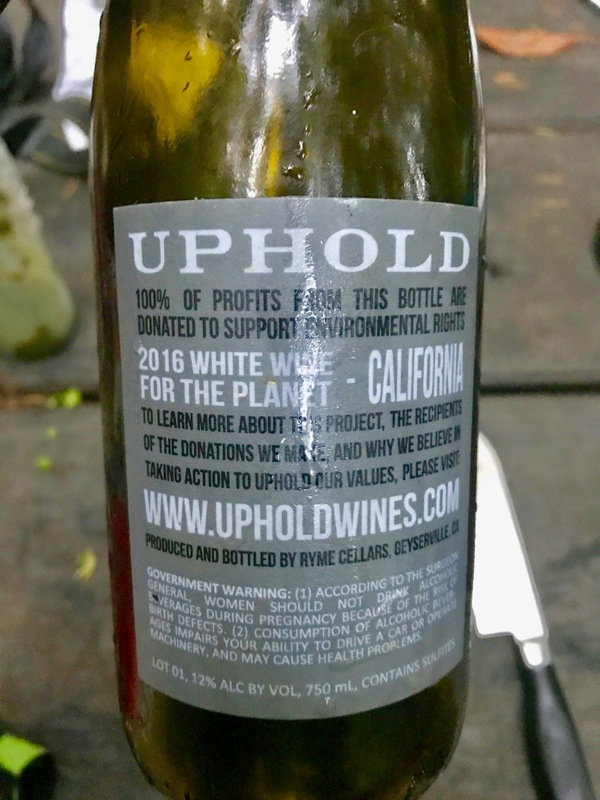 The 2016 Uphold White is a Vermentino based white blend that is super crisp and refreshing with citrus and herbal notes, but it also has a roundness to the body. It’s perfect for summer drinking. Pork Chile Verde Greg made in advance of our trip. We had a stroke of genius in advance of our July camping trip up in Humboldt. We had some stewed meat dishes we’d made and had extras stored in our freezer–this pork chile verde was one of them. (He used this recipe as his blueprint.) We packed these frozen stewy meats along in our cooler while fully frozen and they thawed slowly over the next couple of days. All it took was some reheating in a pot and we got to have a couple of super complex and flavorful dinners while out ‘roughing it’. We enjoyed the chile verde with tortillas with cheese and green onion that we grilled right over the fire. It’s so on the nose, I had to do it. Plus, I figured it would be a good burger wine–it was. The 2016 is 91% Zinfandel and 9% Petite Sirah from the Ceja Vineyard in Sonoma County. The fruit is co-fermented using native yeasts and aged in a combo of older French and American oak barrels. It’s a juicy zin with fresh bright berry flavors. It’s not overly jammy with medium, smooth tannins. It was on the simpler side, but all-good for sipping with burgers by the fire. We stacked the burgers on English muffins with cheddar. You gotta have burgers at least once on multi-day camping trip and didn’t want to have to pack an extra bag of buns. English muffins can do double duty at breakfast time. We had Parmesan zucchini spears alongside that I sautéed in our camping pot. 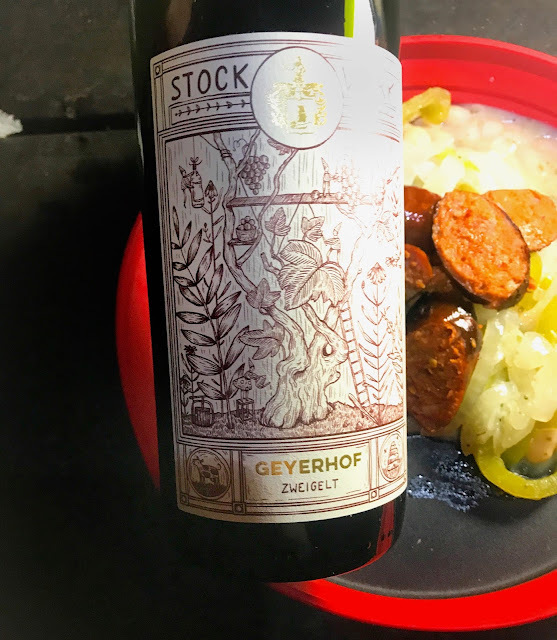 StockWerk literally means “work on the vines.” The grapes for this wine grow on cool sites south of the Danube river through all organic farming practices without the use of any pesticides, insecticides, or weed control substances. This is a super easy drinker with lots of blackberry and black cherry notes along with light pepper and spice. Despite the dark fruit flavors it’s medium bodied. 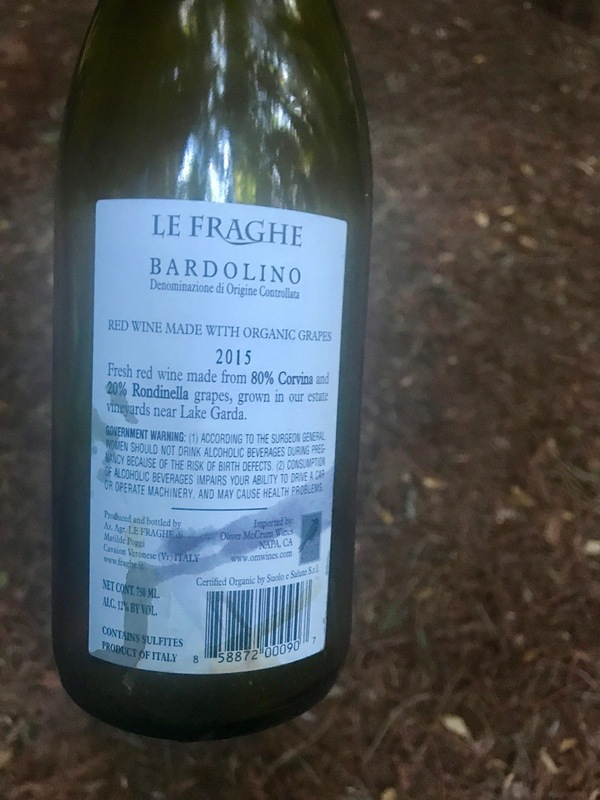 It also hits a couple of other camping wine touchstones–it’s under screw cap and takes a chill well. Because of the wine’s fruitiness it can handle some spicier foods, so we paired it with Andouille sausages grilled right on the fire. (Pre-cooked sausages also keep really well in the cooler.) As s side, I sautéed some onions with garlic in our little camping pot and added a can of cannellini beans, Parmesan, and salt and pepper, and I left the beans on the saucy side. Super easy and very tasty. 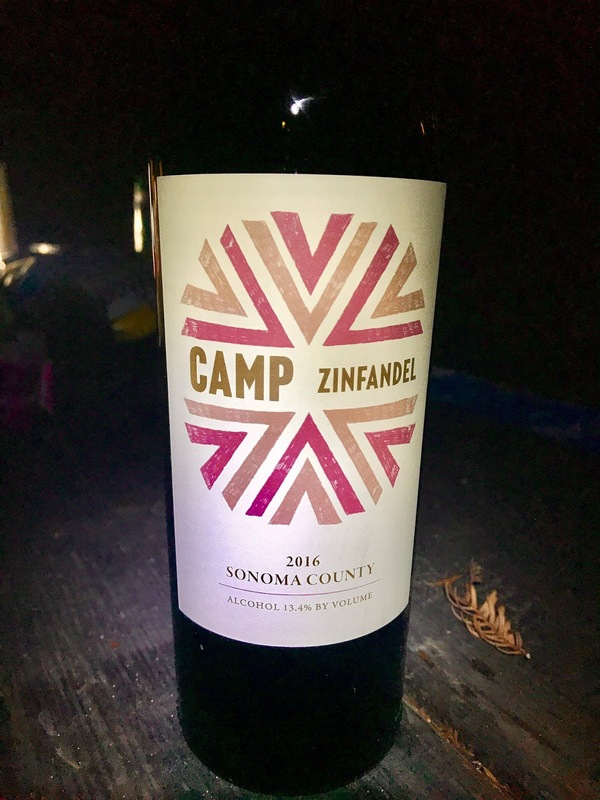 This is another fun wine that again hits a few different camping wine tenets–screw cap, takes a chill, and it’s easy drinking. As a bonus, this wine comes in a liter bottle, so you can keep the good times going around the campfire a little longer. The wine is made by two sisters (Birgit and Katrin) in collaboration with the Blue Danube Wine Co. The sisters took over the farming of their family’s ancestral vines in Hungary, and have been increasingly involved in the family’s Austria estate as well. They use organic farming practices on old vines and wild fermentations. The wine isn’t super complex, but it’s a delight to drink. It’s medium weight and has lots of juicy black fruit with spicy black pepper notes. This was the second meal where we made use of a frozen stewed dish. From time to time, I’ll make a big batch of carne mechada (see the recipe on nibblinggypsy.com) and we freeze the extra. We busted out a batch for the camping trip. We brought along a package of instant rice and mixed that with a can of black beans seasoned with garlic and cumin. We layered the meat on the black beans and rice with a sprinkling of cheddar and sour cream for easy carne mechada bowls. Bardolino wines come from a region right near Lake Garda in Italy. 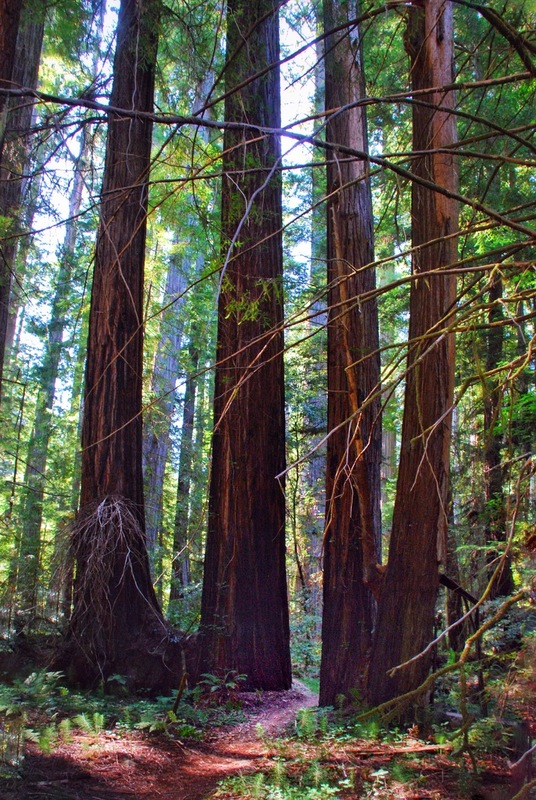 (Totally dream of going here, but that’s a tangent.) The region is in the Veneto and if you happen to be familiar with Valpolicella, Bardolino is right next door and made from similar grapes–Corvina and Rondinella. 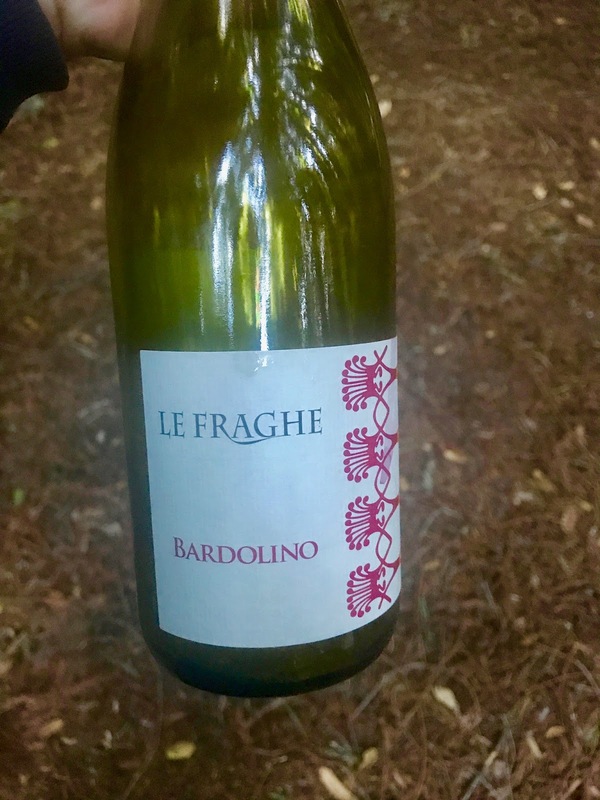 The Le Fraghe is fresh and bright with bright red fruit flavors–bruised strawberry and sour cherries– as well as a little spice. It’s really easy drinking–a perfect afternoon sipper. We enjoyed this while playing a few rounds of bocce ball. 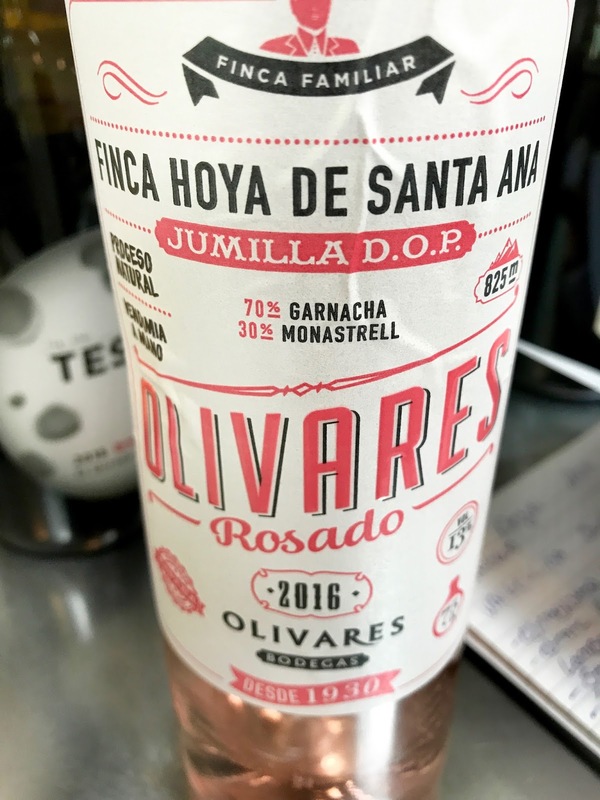 I covered quite a few rosés this summer, click here, here, and here for a few more options. I love hiking. As far as I’m concerned, one of the best things about camping is the easy proximity to trails. 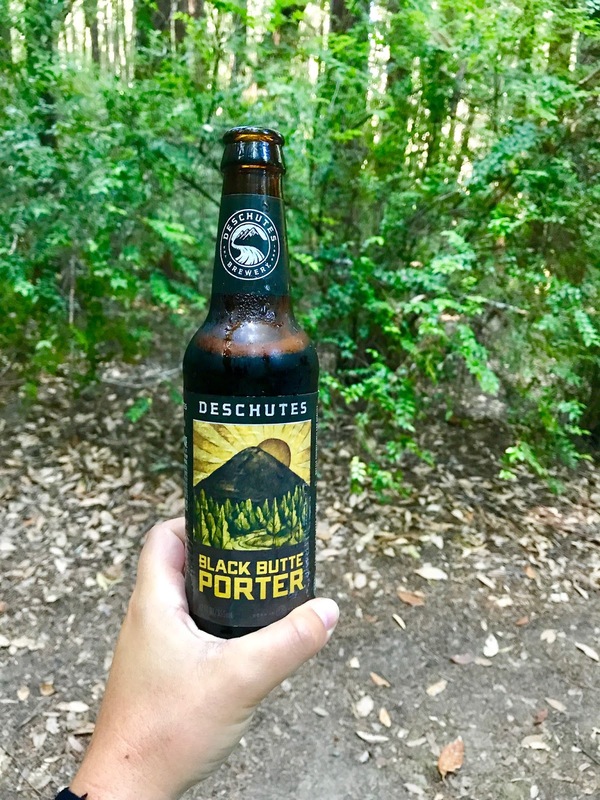 After a hike, I definitely like treating myself to a little reward and sometimes you just want a beer. This Deschutes Black Butte Porter went down quite well after several long hikes on our recent trip to Humboldt. It’s smooth with lots of coffee and chocolate notes, and it’s rich, but it was still refreshing enough to enjoy after all that hard work. I bought all of these wines at Bay Grape–admittedly keeping it easy on myself since was there at work already. The beer we bought en route. Do you have favorite wines to drink in the Great Outdoors? Please share! And as promised, a few scenery pics to draw you outside. Greg took these two as well as the cover photo at the top.